The Economist almost never comes on Friday. It sometimes comes on Saturday. It often doesn't make it out here until Monday, leading me to grumble that they get better service in Cairo (they do). But this week's came today, and the cover is just perfect. My kids loved it too. 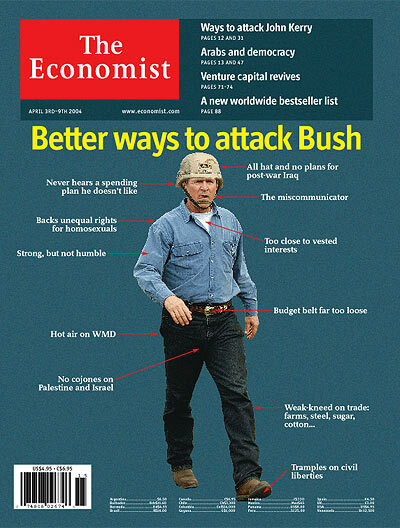 that is a great cover, and I’d guess many Republicans who find Bush difficult will like it too. Bah. Everyone knows the Economist is a Communist ra– oh, wait.